CW3E postdoc Brian Henn has published a study on estimating evapotranspiration (ET) in California’s Sierra Nevada in Water Resources Research titled High-Elevation Evapotranspiration Estimates During Drought: Using Streamflow and NASA Airborne Snow Observatory SWE Observations to Close the Upper Tuolumne River Basin Water Balance. 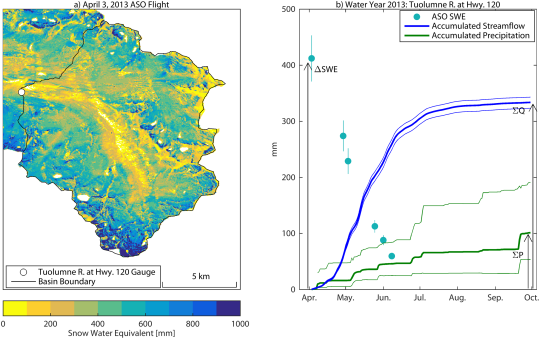 The study leveraged NASA Airborne Snow Observatory (ASO) and distributed streamflow observations and a basin-scale mass balance approach to estimate ET across the upper Tuolumne River watershed region over three warm seasons (2013-2015), showing spatially coherent totals of about 200 mm per year of ET for these high-elevation areas during California’s recent drought. This represents a novel application of ASO and mass balance approaches to estimate ET at the watershed scale, which is difficult to observe directly. The Tuolumne watershed and others like it the Sierra Nevada are critical water supply areas for California, and changes in ET in the future could impact the reliability of major reservoirs. The paper was written in collaboration with Tom Painter and Kat Bormann of the NASA ASO team, Bruce McGurk of McGurk Hydrologic, Lorraine and Alan Flint of the USGS, Vince White of Southern California Edison, and Jessica Lundquist of the University of Washington. Please contact Brian at bhenn@ucsd.edu with inquiries. Figure 1. Figure (1) from Henn et al. (2018): (a) ASO lidar-derived 50 m SWE map for 3 April 2013, over the basin of the Tuolumne River at Highway 120. (b) Example plot for this ASO flight, showing how the basin’s water balance is quantified. All SWE from the 3 April flight is assumed to melt by 30 September ( math formula); cumulative streamflow ( math formula) and precipitation ( math formula) between the flight date and 30 September are then calculated. Uncertainty bounds at 95% confidence are shown for each variable.